This was a weird year for us in finding a gate guarding job, but in all fairness that may have been due to when we came. In the past we did Beets, Trees, or Amazon in November and December and this is the first time we came down in November and tried to get a gate. What we didn’t know when we made that choice was that gates are very slow in November because of the holidays and hunting season. Many of these ranches double (or triple) as oil fields, cattle ranches, and deer hunting areas. In order to give their clients a pleasant experience, many don’t schedule heavy truck traffic during hunting season. It’s also a common time that the workers want off as well, and between all of those factors not many new gates open. Of course there are existing gates and they can become available to those of us waiting at any time, but unfortunately the few we were offered did not allow pets. I knew having Jack might be a bit of a handicap, but since I know many people who stay busy gate guarding and have pets I didn’t think it would be that big of a factor. Unfortunately the openings were either gates or shacks and the shacks were an issue for us as well. The shacks are twelve hours and since it is more desirable for couples to work together, that’s how people are often scheduled. We knew we couldn’t leave Jack alone for 12 hours a day, so we wanted opposite shifts, and it was a while before that became available. We also talked to several companies about pipeline jobs which are new to us and pretty hot this year. Initially we were told they had pipeline jobs at $300 a day where one person worked out of their rig and the other worked from the car, but eventually we learned these weren’t very common. For $150 a day lots of people are working 12 hour shifts (dawn to dusk) from their car and if you have two vehicles that could be $300 a day. Unfortunately we don’t have two vehicles (although we did talk about renting a second vehicle at $750 a month), but again Jack was an issue. Twelve hours is just too long to leave a dog caged and since he is not fully trained, we wouldn’t have any other choice. Plus I really didn’t like the idea of sitting in a vehicle for twelve hours with no fridge, a port-a-john, and in many cases no internet. Finally, we accepted a W-2 shack position that we could work opposite twelve hour shifts ($12.50 an hour with eight hours of paid OT a week, and four days on then four days off), but at the last minute Lee said he really didn’t want to do it. He probably could have handled the hours, and we would pay for our own RV park, but the rate was controlled at $350, but the uniform was a bit of a killer. Steel toed shoes and company provided polos were no issue, but we had to wear khakis. I actually have several pair that I brought when we went on the road, but Lee doesn’t have any. We could have bought them of course, but he was very concerned about laundering them. No way would they be wrinkle free using our Splendide which meant using our very small travel iron and dorm sized ironing board. If you knew Lee you would understand that he just doesn’t wear wrinkled clothes, and the hassle of keeping those pants wrinkle free living in our RV really turned him off. He had other “gut feeling” issues about it as well. Thankfully when I called an apologized and asked if they could put us on their waiting list for a 24 hour gate where we could work out of our rig they had a recent opening. 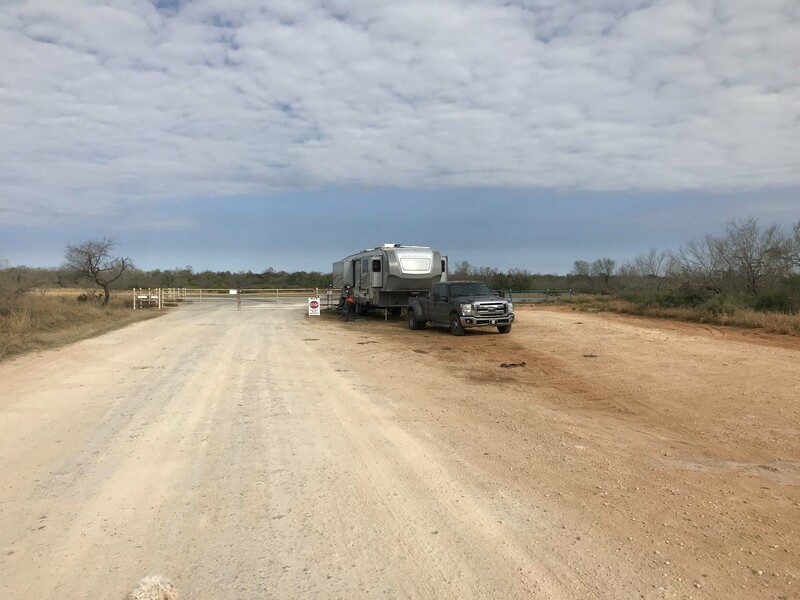 We immediately accepted the position and since the gate started the next day, we packed up, said goodbye to our friends, and drove 3 hours down to the gate which is north of Laredo. In previous years I probably would have had concerns about working so close to the border, but with the increased border presence I wasn’t concerned. Plus we are 3 miles from a border patrol station and located in a pretty safe place. Jack had no idea that we were about to leave his friend Hobie and the only place he has known since we got him. It’s been a blessing being in one place while he got settled in, but we knew he was going to have a crazy day and we hoped he would be OK with it. We found time to play a little before we left and then got into the car. 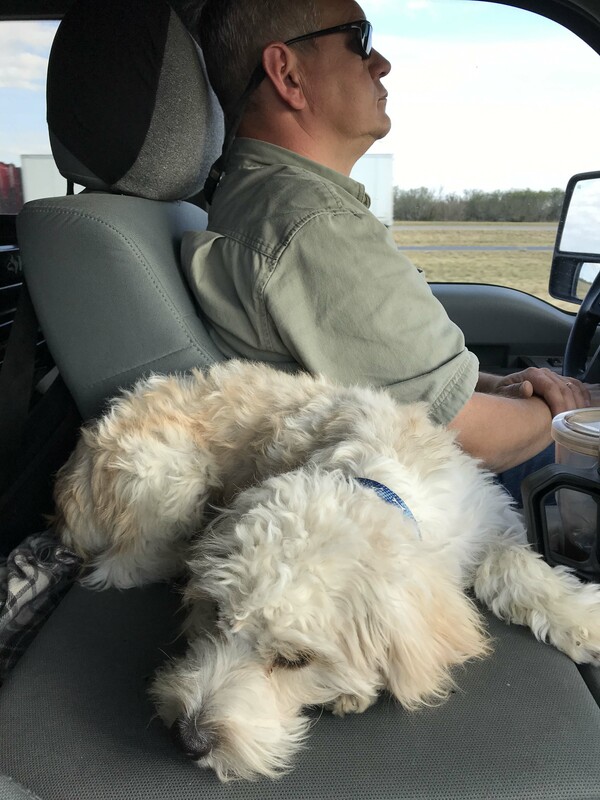 The ride in the truck is much rougher when we are towing and the roads in San Antonio are in pretty bad shape from construction. He did OK, no throwing up thankfully, but we were unable to get him to go to the bathroom when we stopped at a truck stop. So far we have never been able to get him to go, since he seems overwhelmed by smells, but thankfully he has a good bladder and so far not an issue. I was more worried when we finally made it to the general area of the gate because we had a 20 minute wait on the supervisor to show us the way and still couldn’t get him to go. He usually lays on the floor behind my seat but it was pretty rough so he curled up next to us. Then we arrived at the gate and as always, it was a flurry of activity. You are trying to set up, they often have a second trailer and are hooking you up to water and a generator, and there is always some “training” as well. I didn’t want to leave him in the car and the RV was still a mess so ended up walking him on a leash. 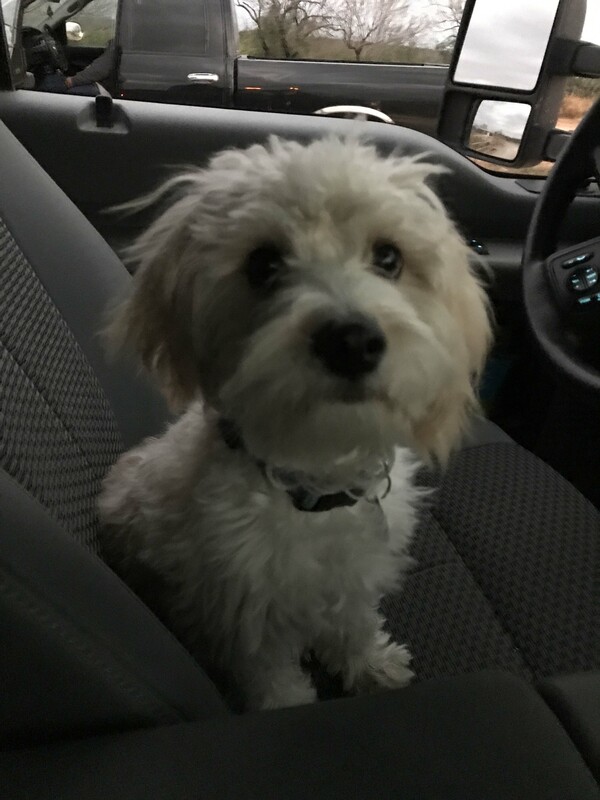 It wasn’t the best choice, and if I had it to do all over again, I probably would have left him in the truck longer. The gate is very nice, with a wide spot and very dog friendly. We are very close to the road, and realized he would need to stay on a short lead to ensure he didn’t get in the way. At this point, Jack was overwhelmed by smells and sights and the occasional semi-truck going through was not helping. He did fine with the smaller vehicles, but the big trucks really freaked him out. Settling into our spot. Luckily Lee didn’t need my help backing up because I had Jack. Thankfully our supervisor was understanding and gave us time to put out the slides and open up enough I could put Jack in his crate. Then we spent an hour going over paperwork and training, which was actually pretty great because often in the past we have just been thrown on a gate. This one has an iPad and I really like the interface as it is much simpler than the iPad we worked on with another company. The one downside to starting a new gate with an iPad was the extra time it takes to get people entered that first time (subsequent visits they are easy to pull up) and we knew tomorrow would be a long day. 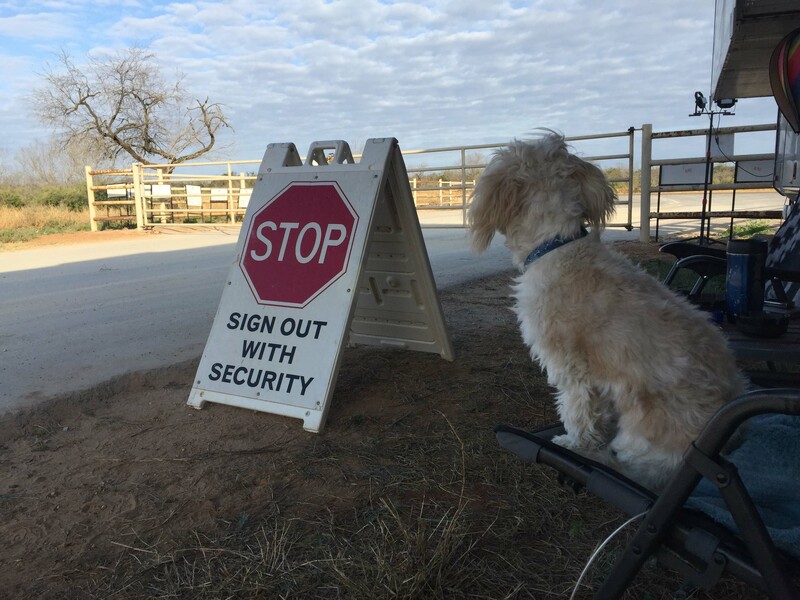 I’m a gate guarding dog! After the supervisor left, we ate a quick dinner and then tried to get Jack to go to the bathroom. Initially he was having none of it, but eventually we found a place he would go. That’s when we learned that this part of Texas has little burrs, and tons of them. Jack’s paws were covered with them by the time he finally went and I spent another 30 minutes cutting them out. Keeping him on the dirt or pavement definitely helps, but we he wants to go in the grass, which is full of them. At this point we were all exhausted and Lee had a 6am start the next day. We weren’t sure exactly how we were going to manage Jack, but I knew I had to try and stay up so I could start night shift the next night. Don’t get me wrong, we are both thrilled to finally be working, but first days at gates are always stressful and worrying about Jack didn’t help. Partly we weren’t sure what to do, partly this was his first experience out in the world. We are still dealing with normal puppy stuff which is hard enough in a sticks and bricks, but super challenging when you are working and moving around. Hopefully he settles in pretty soon, and we do as well! 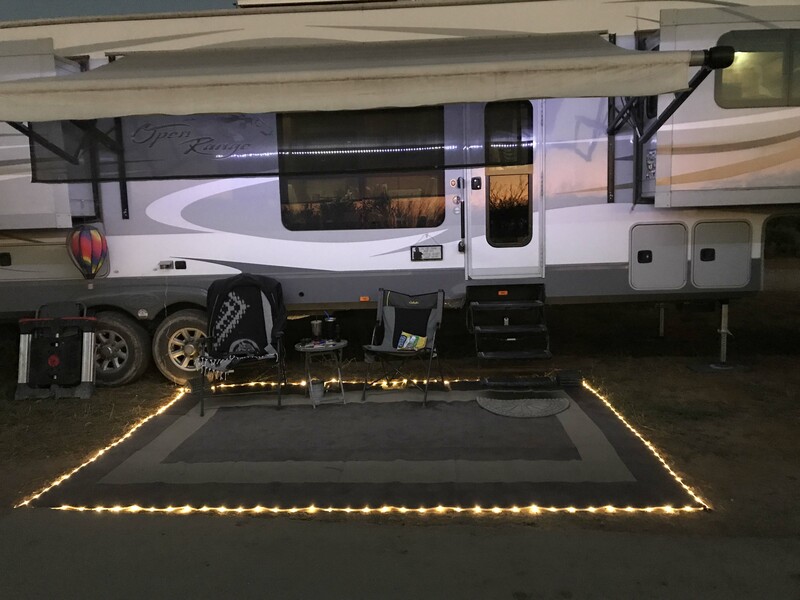 On the plus side I bought a light up rug on clearance at Camping World a few months ago and it is working great. I hated that I couldn’t see in the darkness under the rig (rattlesnakes!) and this does a great job of lighting that area up. This entry was posted in Lakeside and tagged gate guardijng. Bookmark the permalink. Congrats on your new job! Sounds like Jack has a good bladder. Our female seems like she can go forever, while the male goes more frequently. The burrs are a challenge to be sure. We just stay in the rocks or gravel. They do eventually learn. That’s the problem with a cute furry dog, is they pick up so many burrs, and they hurt you as much as the dogs pulling them out. We actually have booties for ours for when burrs can’t be avoided like at the ABQ balloon fiesta. But they are a hassle. 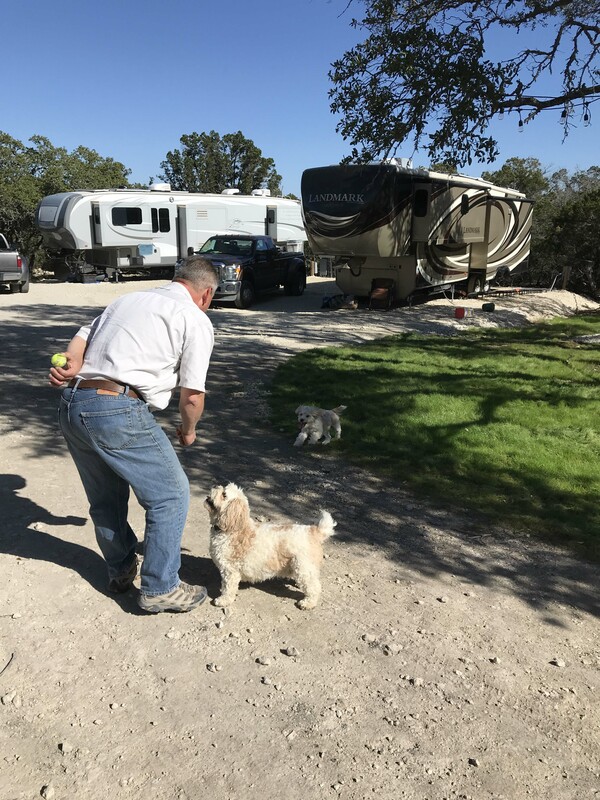 One last thought, we now leave our dogs in the vehicle until our fifth wheel is leveled and the slides are out. They just seem to handle the new location easier. They can come in and smell around inside and it looks like home again. Otherwise they’d stress for a little while as we tried to set up. Thanks Leslie that’s great advice on leaving him in the truck. Makes perfect sense he can go in his house first and then explore the outside ! Like that rug. You mentioned you were worried about your safety near the border. What is the concern? (I’m not from around there.) Thanks.